Jackson, Tn. – Come join us at Carter’s Nursery, Pond & Patio for our annual Spring Fest.! We will have lots of fun and informative things to take part in. Bring the kids and let them pet the animals at our ‘Petting Zoo’. There will also be Pony Rides available for the kids. For the Adults, we will have several opportunities for you to learn all about Water Gardens! You can get all the information you will need to Design, Build and Maintain a Beautiful Water Garden, Pondless Waterfall or Koi Pond of your own. So if you have a Water Feature and want to learn more about it, the Aquatic Plants available, Pond Fish like Koi, Comets & Shubunkins, etc. you will Love it! A…ND, if you don’t have a Water Garden, but have been wanting to find out more about them, this is for you too! Classes will start around 9am. and will go all the way through till 2pm. We will perform a ‘Hands on’ cleanout of 2 Ponds on site! You can actually see all the work being done, learn and ask questions right there on the spot! We will also have a discussion on Water Garden Design and “How To” Implement one in YOUR Landscape! We will cover the basics of Aquatic Plants and discuss how you can introduce more Aquatic Plants in your Waterscape AND your Landscape. I will be cooking lunch for all that come, my treat! I’m fixing Hot Dogs and Smoked Sausage with ALL the fixings! We will also be firing up the Saffire Grill to cook some special things & we are going to smoke some pork shoulders on our new ‘Chubby Smoker’! We will have chips and cookies and more! 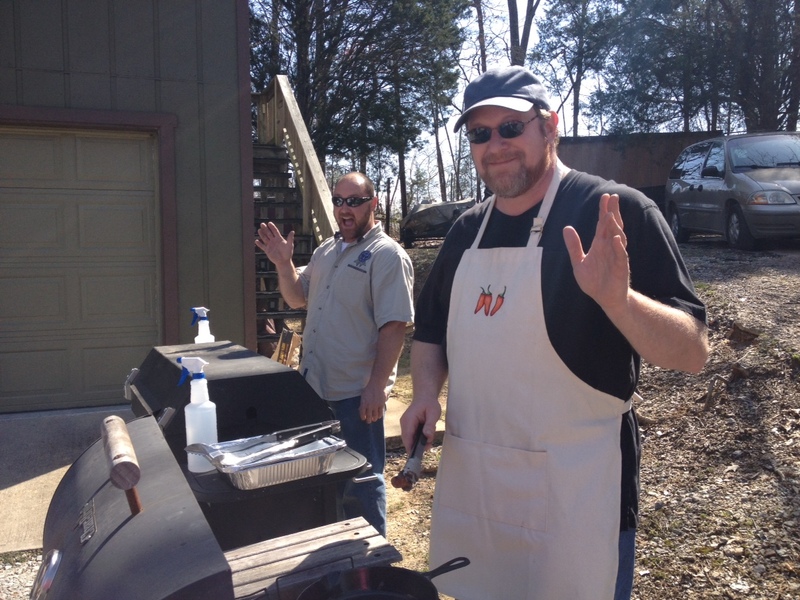 This is my favorite part of the show because I get to grill & cook! When: Saturday, March 28th. from 9am till 2pm. Spring Fest is coming! Carters Nursery Pond & Patio, Jackson, Tn. MARCH 28th. – Carter’s Nursery Spring Festival & Customer Appreciation Day! Something for the whole family! Learn all about Ponds, Water Gardens, Aquatic Plants, Koi & more! Take part in one of our Workshops & classes, enjoy a Petting Zoo & Pony Rides for the kids + GREAT FOOD for all! Come out and help us kick off SPRING! (Saturday 9am. till 2pm.) This is a FREE event! 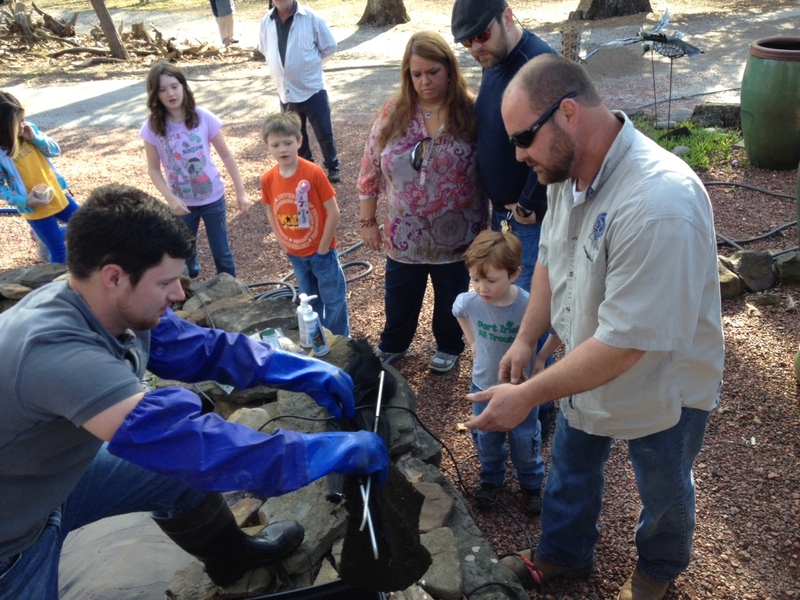 We are holding 3 Pond Tours this year. A Spring Pond Tour (May 16th. ), a Summer Pond Tour (June 27th. ), & a Fall ‘Moonlight’ Pond Tour (September 26th.). All are fund raisers for our local Jackson Madison Co. Humane Society. Unique Water Gardens, Pondless Waterfalls and Fountains will be showcased on the Pond Tours. May 16th. (Saturday) – Our Annual Spring Pond Tour – Our ‘Spring’ Pond Tour. is the 1st. of the season! (Always the Sat. after Mother’s Day) – A FUN and Beautiful Day! This is a Self Guided Tour and this is a Fundraiser for the Jackson Humane Society. We have been holding this garden tour for 17 years and counting for our local Humane Society and we hope you will come out and join us! The tour starts at 9am.! Tickets are $10 ea. (kids under 12 are FREE!). 100% of ALL ticket sales & donations go to the Humane Society! Carters Nursery Pond & Patio is “Pond Central” for the Pond Tour and we invite you to come by throughout the day to sit a spell, have a drink & something to eat and look at the BEAUTIFUL Gardens and Water Features. June 27th. – 17th. Annual Summer Pond Tour – Our ‘Summer’ Pond Tour (Always the Saturday after Father’s Day) is A FUN and Beautiful Day! This is a Self Guided Tour and this is a Fundraiser for the Jackson Humane Society. Tickets are $10 ea. (kids under 12 are FREE!). 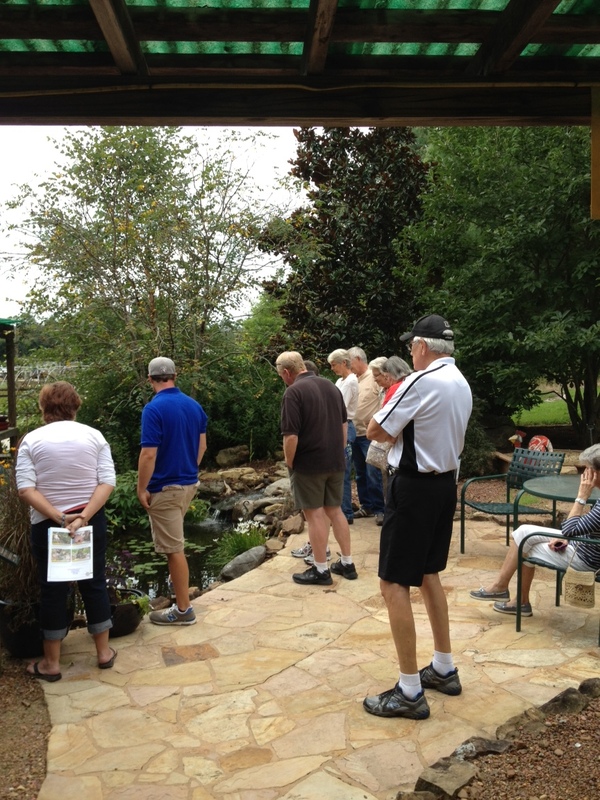 Carters Nursery is “Pond Central” for the Pond Tour and we invite you to come by throughout the day to sit a spell, have a drink & something to eat and look at the BEAUTIFUL Gardens and Water Features. September 26th. – 11th annual Moonlight Pond Tour. This is our Annual Night Time Pond Tour! The tour always falls on a Saturday Night closest to the Full Moon!! Don’t miss this Unique Garden Tour Experience! Tickets are $10 ea. (kids under 12 are FREE!). 100% of ALL ticket sales & donations go to the Humane Society! Carters Nursery is “Pond Central” for the Pond Tour and we invite you to come by throughout the evening and night to sit a spell, have a drink & something to eat. Enjoy the Fire Pit and look at the BEAUTIFUL Garden and Water Feature Lighting. The nighttime garden is a magical world. The Moonlight Pond Tour is AWESOME! Thanks & I’ll see you ‘around the pond’!